The aim at our group is finding the best catalyst for useful reactions, without restrictions. However, some lines are preferentially followed since their focus fits well the main objective. Nat. Mater. 2017, 16, 760 –767. The discovery that extremely small gold clusters of a few atoms very efficiently catalyze various organic reactions (Science 2012) triggered a research program on catalytic metal clusters. Since then, a variety of organic reactions catalyzed by in-house prepared subnanometer metal clusters have been reported. Catalysis with few-layer pnictogens (P, Sb,…). Highly delaminated phosphorene and antimonene are now available materials whose use in organic synthesis has been rarely explored. Indeed, these solid materials show outstanding catalytic properties, and it is our aim to study in-depth their implication in organic reactions of interest. Solid catalysts for organic reactions. Chem. Sc. 2017, 8, 689−696. Industry demands efficient solid catalysts for easier process operations. 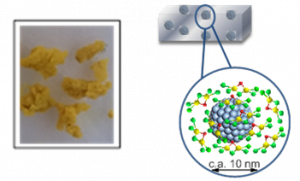 simple solids, such as zeolites or supported metals, have been implemented here for new catalytic methodologies, either for the production of multiton industrial molecules (vinyl chloride, cyclohexanone,…), drugs or natural products. Angew. Chem. Int. Ed. 2015, 54, 5658–5661. Cascade reactions shorten previous synthetic routes by performing the whole process in a same reactor. They are of interest not only academically but also industrially. The group has achieved some success for industrially relevant compounds. The use of classical organometallic compounds as a catalyst is also studied in the group.